This level has medium difficulty and you need to use good technique to complete this level. For this level you should try to play from bottom part of the board and try to play from bottom where you have more candies plus break honey that is in bottom. Make special candy as you get the chance to break more honey to save all bears within 30 moves. I hate this level. …..what the freak man. I’ve been on this level for several weeks and am fed up. They take the fun out of this game. Ready to quit entirely. Hardest level, so far. 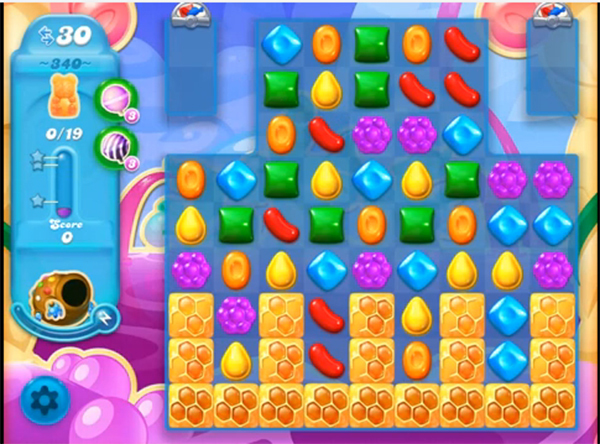 No strategy works, have matched special candies all over the place. Matched sp. candies and bomb things, barely does anything and will never understand why those swirly round things are supposed to be the best thing in the game. They do nothing. I understand people win it but when it’s that difficult for so many people and so dependent on luck it does pretty much ruin the game. No luck so far. Too hard – designed to force you to buy extras. They ain’t begetting any money out of me! I’m tired of these hard levels. I play from the bottom like the tips say to do, but that doesn’t seem to help. Why can’t you give us some easy levels for awhile? I’m tired of playing this level already. I get useless garbage moves at the top. Tips always to say play at the bottom but you can’t most of the time. “Cheats” and tips the same for each level, basically just common sense, no real tip or trick.